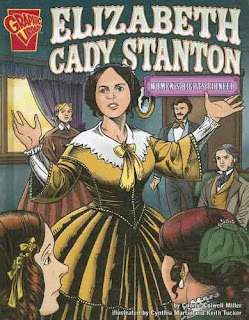 Women’s rights advocate, Elizabeth Cady Stanton, is a staple in elementary education – a woman of strength and progressive thought whose death preceded her intended goal. Like most strong women, Stanton’s views were considered edgy and controversial. Despite the poor treatment of women she continued her fight to end discrimination in the face of strong opposition by powerful men. This strong woman, who knew her place was not relegated only to the home and child rearing, was an instrumental and influential force in the women’s suffrage movement. The story is short and offers a primer on the life and times of a woman who refused to live with oppression and discrimination, a small portrait of one woman’s life. One- and two-panel pages are combined with generous amounts of dialogue and narration bubbles to make for significant factual information, without the burden of dense paragraphs. The art is heavily inked and bright. Most students under age 8 would not be ready for the vocabulary, otherwise there is nothing preventing younger children from accessing the book. This short biography gives the young reader a glimpse into the struggles and trials of one of America’s most influential women and the forces of opposition that stood in her way. The lesson is a strong one for all children – boys, girls, ethnic minorities, persons with disabilities, those in poverty – one person can make a difference in a democracy and affect the lives of everyone in an oppressed group. It takes education, determination, perseverance, and alliances with like-minded spirits to achieve a goal greater than one’s self. Capstone offers an additional facts list, a glossary, Internet sites, an index, and a bibliography. Children need to learn about democracy and how to affect change appropriately and civilly. That begins with studying some of the great advocates of history, including Elizabeth Cady Stanton. I heard from one mom this week who, on my recommendation, ordered some comic literature for her fifth grade girl. The mother reported yesterday that she is having a hard time keeping up with her daughter’s voracious comic appetite. Her favorite is KAMICHAMA KARIN, but she is also very fond of BONE and AMULET. I asked the parent, has she ever been that excited about reading or been willing to read so much and so often? As you can well imagine, the answer was an unequivocal and resounding “no”. “I am spending $20 a week on books for her,” and that is still not enough. Mom went on to say that the daughter goes out to the mailbox every night and looks for new graphic novels, which they purchase from Amazon.com. She then runs to her bedroom to staying up until after 10 p.m. Comic literature can and does make a difference in the reading habits of children and teens. Research supports that statement and anecdotal evidence reinforces it. Kids love comics. Following is the list of comics and graphic novels that came into the classroom this week. As always, we provide links so that you may check the books out yourself if you cannot wait for the review. Maybe that's why a story such as Brian Michael Bendis's FORTUNE AND GLORY retains such an appeal even when it is – at least in part – a self-indulgent exercise in Hollywood name dropping. Bendis recounts his adventures attempting to sell his screenplay based on his graphic novel GOLDFISH. The true story requires him to interact with every stereotypical Hollywood phenotype: sleazy agents; ignorant producers; suicidal screenwriters; and manic, profane heads of HBO programming. But more interestingly, Bendis' graphic novel dramatizes how the dream of being a Hollywood screenwriter warps his sense of self and sends him on violent upswings and downswings as his screenplay winds its way through the various purgatories of treatment, pitch and development. No matter how hard he tries to keep humble and remember his comic book origins, the dream and the ego of Tinseltown overwhelm him. However, for a teacher, there are a number of downsides. In various places there are sexual jokes or references that some parents may object to. Also, the graphic novel is particularly text-heavy. There is no color in the graphic novel; the characters are often engaged in quick, back-and-forth dialogue without much action or any explosions. Despite a well-designed and varied visual style, the graphic novel relies on a pretty sophisticated sense of wordplay and irony for its effects. Students who struggle with reading might be encouraged by either the subject matter, the sarcastic humor, or the visual inventiveness, but then again...maybe not. Fortunately, the story is told with intelligence and self-deprecating humor. Students who are interested in how movies are made and written might be inspired by the struggles that go on in creating and selling ideas as well as the fact that the main character makes his living writing graphic novels. Bendis makes the enterprise of writing stories seem like the coolest possible profession to enter, despite the mammoth obstacles lurking in the way for those who want to be successful. 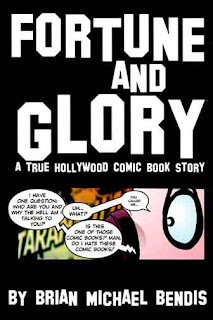 FORTUNE AND GLORY succeeds in making a graphic novel into an entertaining monologue told by a gifted storyteller about the heady and absurd process of getting your story made into a movie. As you may guess, my future classroom will not be filled with pretty little posters of cute kittens hanging on a branch with the caption: “Hang in there, baby.” Oh no, my classroom will be decorated in heroes, both super and the non-super variety. One of my focuses is on helping students find passion and purpose in life, to understand the bigger community, and to find peace in doing for others. We are in search of our inner hero. I happen to use comics as a significant catalyst to achieve my end goal. How about linking that bigger goal back to the curriculum, and to mathematics specifically? Enter HeroClix by WizKids. 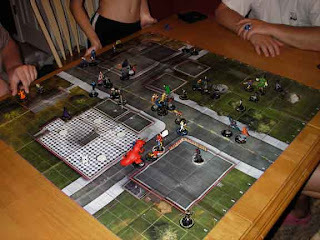 HeroClix is a superhero game played on a foldable map. It is strategy game very similar to Risk, but with more mental mathematics. The game pieces consist of 3-dimenstional superheroes on a round base. The base has a window with that superheroe’s statistics showing through. Whenever that superhero is attacked and is injured, then the dial on the base is moved or clicked, and a new stat appears. If the superhero takes enough damage, then he or she clicks a KO (knock out) and is taken off the board. 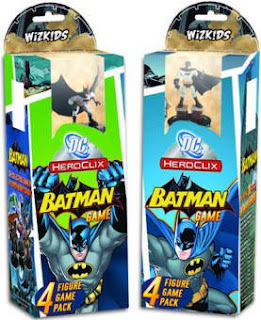 Unlike educational games that are designed for the classroom, and games where kids know they are being tricked into doing mathematics, HeroClix is an authentic game played by kids and adults at real tournaments across the nation. There is no trickery involved; it is the real deal. The game rules can be very complicated, but they do not have to be. Each superhero has a set of powers that can also come into play. However, the game can be played sans powers, which makes play easier to learn and faster to play. As well, HeroClix has created the Alpha series, which has simpler rules and is geared for ages 8 and older. Confused? I know what you mean. It’s really not that bad at all and it is a huge draw for kids, especially boys. Did you catch that? It’s worth your time. Most comic book shops have HeroClix game days, where people come in and play. The sage players are very good to slow down and assign a mentor to teach you the essence of the game. My 8-year-old daughter and I bought some HeroClix and recently went to our first HeroClix tournament at my local comic shop. When I told the players that I was a teacher and I wanted to introduce HeroClix to my students, they teamed up and went through their stash. They culled out over 200 game pieces, 5 maps, and a pair of dice then donated it to my future classroom. Why would they do this? You see, HeroClix is sold in boxes with several game pieces inside. You don’t know what game pieces you are getting. Consequently, you end up with multiple pieces of the same figure. That means that most players have extra pieces they do not need. These guys take this game seriously and have hundreds, if not thousands, of game pieces. So it is easy, and quite common, for them to donate extra pieces to newbies. 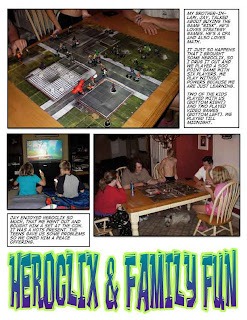 These folks love their HeroClix game and want to share it with others. I am certain that they would even volunteer to come to your classroom and teach you and the kids to play. Amazingly, it’s not as geek-filled a game as it sounds. I brought it home, sorted my figures and put out a map. My daughter begged my wife to play and she agreed, albeit reluctantly. At the end my wife said it was a lot of fun. During every turn I helped my daughter make decisions. She did the math and rolled the dice. Small maps can be played in 15-30 minutes, perfect for that rainy day of indoor recess. A teacher could use two or three game pieces on the document camera to demonstrate the need for mental mathematics abilities and to teach the addition and subtraction strategies. You could even have small tournaments in class to give kids some mental math practice. The game also promotes diversity as there are characters that are female, persons representing minorities, and those with disabilities. If you are looking for a way to bring superheroes into mathematics, then consider HeroClix. 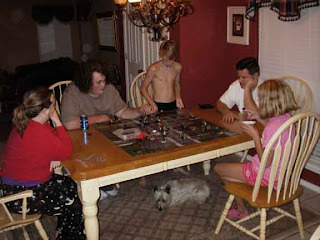 During my trip to DefCon 7, I introduced the game to my sister’s family. We stayed up until after midnight playing and had a fantastic time. We even donated some pieces and a map to the family for putting up with comicness all weekend. Stinky the monster and Wartbelly his pet toad are a couple of dirty little guys. They root and play in filth, eat pickled eggs and pickled bananas, and enjoy all things … well, stinky. The two are wary of the very scary, and very clean, kids on the other side of the swamp. He has no use for the sanitary little buggers; he steers clear. That is, until he discovers that a little boy made a tree house right in the middle of Stinky’s swamp. He vows to rid his world of the boy. Stinky tries his best to shoo the child – hiding his tools, stinking up the treehouse, dressing as a ghost – but to no avail. When the boy loses his hat, Stinky finds it and throws it into the local bottomless pit. Stinky’s conscience gets the best of him when he realizes it was the boy’s lucky hat, so Stinky tries to retrieve it, falling into the pit. It is the boy who saves him and an unlikely friendship is formed. Toon Books creates comics for emergent readers, ages 4 and older and was started by Pulitzer Prize-winning comic creator Art Spiegelman (Series Advisor) and NEW YORKER Art Director François Mouly (Editorial Director). Never before have we seen comics designed for emergent readers and STINKY fits the bills for a kid’s first comic. Mixing stink and mud, toads, slugs and possums together with a helping of diabolical plot to scare the pants off a little boy, and you have a story that children will delight in experiencing over and over again. The art is delicate and creamy, colorful but slightly muted. There are 1 to 4 panels per page, with small amounts of dialogue. Click here to see some sample pages. 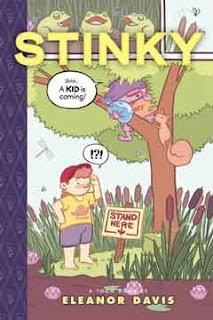 STINKY is a perfect concoction for very young children, and a good primer for readers who have just learned to read and those who cannot yet read by themselves. STINKY is an obviously choice for the early childhood and kindergarten classroom. Reading should be fun and enjoyable; reading should be a treat for children, a bright moment in their inquisitive lives. STINKY provides that experience for emergent readers. So, CryptoZooey #1 was a hit at Comic-Con – and it was Well. Frigging. Deserved! Charming and funny, there is a little related-something akin to my youth’s sacred WHERE THE WILD THINGS ARE that called-up my inner monster-fearer from below my inner dork that made Sarah and Steve Troop’s comic immediately endearing. 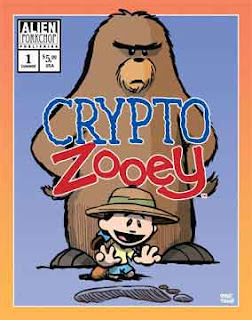 It’s no stretch of imagination to understand what won over Comic-Conners when it is marketed as “CryptoZooey. A girl. A quest. And the monsters that help her.” Monsters rule. Now, Zooey’s parents were cryptozoologists, which as we all know are the people who told us all that monsters don’t exist. Liars! – we learn. On one of their voyages, however — if I understand right — they just don’t come back, so little Zooey must be raised by her grandmother. But when grandma croaks, Zooey must live with a distant and mysterious relative – a Mr. J.D. Leeds. It’s hard to say anything more about the storyline without spoiling it, but chalk-up a little Lemony Snickett and a dash of MonsterQuest and you’ll get the idea. Steve Troop’s art is, IMHO, reminiscent of newspaper strips like Calvin & Hobbes. I say this because Zooey looks, well, like a transgendered Calvin. But the degree of detail he inks into the background, into newspaper clippings and wide-panel haunted scenery, is just great. The expressions are hilarious and the bubble-logue ingenious (or, at least, super cute [refer: Jackalope]). As an author and illustrator he obviously enjoys his craft, and the paneling — albeit busy — never seems like it were tediously done: it doesn’t take itself too seriously, which means that there is abundant tomfoolery and good stuff – like the sound of thunder! KRAKATOOOOOM! Sarah Troop’s coloring, though, is excellent. Yeah. Italicized, underscored – jawesome. Sarah and Steve Troop have a special thing here. I recommended a subscription to my colleague in Children’s and hope she takes me up on it, as I am just as excited for Issue #2. CRYPTOZOOEY is deviously educational, reinforcing brain-cells under the cover of entertainment. And unlike my copies of Fables (don’t ask), parents would welcome the Troop’s comic into their library. It’s a fun read. This week is the perfect example of the varied comics available to teachers and librarians: comics for children, comics for teens, comedy, drama, girl power, traditional literature in comic format. The list goes on and on. The cover of the journal shows a teacher, pointing to facts about famed abolitionist Frederick Douglass that she has written on the chalkboard. Kids in the seats are barely paying attention. One student is staring up at the ceiling, with a smile on his face that indicates his mind is elsewhere. Another boy, with his tongue dangling off the side of his mouth like Michael Jordan on the way to the hoop, is doodling and drawing with intense focus. Suddenly, the teacher's shadow looms over the doodler. A look of panic crosses his face as the teacher grabs the paper and glares first at him and then at the artwork. Suddenly, in the final frame of this cover laid out like a comic, the teacher holds up the work, which is a student-created comic book about the life and times of Frederick Douglass from his times as a slave to his emergence as a leader. It turns out this student was listening after all, and was absorbing the information all along. But, like many young learners, he just needed another way to show what he knew. Give him a standardized test, and he might not do so well. Hand him a blank comic template and knowledge flows. And so Teachers & Writers moves its way into the world of comics and graphic novels for its Summer 2008 edition (Volume 39, Number 4). For teachers who wonder about the possibilities for comics and graphic novels in the classroom (for young writers and for young readers alike), this journal has a wealth of experience and reflection to draw upon. As editor Susan Karwoska notes in her introduction, Teachers & Writers is attempting to "explore how writing and reading comics can strengthen writing skills, spur the imagination and boost literacy in the classrooms from kindergarten to college and beyond." And that it does, moving from Michael Bitz's explanation of the success of The Comic Book Project as a way to enhance literacy through social action in many urban schools to David Morice's take on how comics can infuse poetry units to an interview with Ben Katchor, who contributes comics to major magazines and teaches the concept of "visual narrative" at The New School. The articles here are rich with anecdotes, but also bundled with plenty of examples and illustrations. The authors move into the pedagogy of comics in its many forms and many layers. 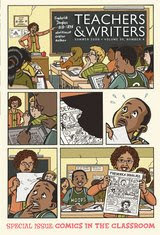 Taken together, this Teachers & Writers edition puts down a pretty solid foundation for the rationale for graphic novels and comics for students of all ages and all backgrounds. 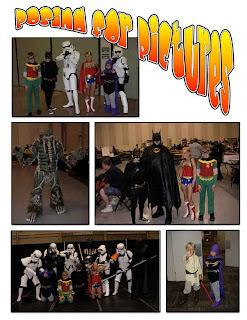 Bitz sees it all the time with The Comic Book Project. Bitz writes: "When I see the spark in a child's eye as he expounds on the gears of his superhero's magical helmet, I glimpse the gears of his own mind working, pushing forward to communicate thoughts and explore identities." Jack King is a bit of a screw-up. He’s a good guy and all, but he has no purpose, no drive, no umpf. Jack’s father hires Jack as the superintendent of his father’s run down apartment building, hoping the job will inspire him to excel, to care. Jack could not care less, but he tries his least. While working in the basement Jack finds a chamber, a secret lair, the now abandoned super hero headquarters of HERO BY NIGHT, a long-ago caped wonder who disappeared some fifty years previous. So Jack devises a plan to sell the old hero’s diary on eBay and make a quick fortune. 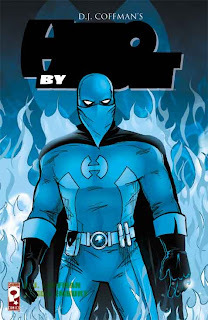 Things just do not work out quite that easily and Jack finds himself the center of an equally long-forgotten super villain who is dead-set on retrieving the diary, and more importantly the super ring of HERO BY NIGHT. For once, Jack finds a life path that suits him. He has to decide whether or not to take the dangerous, unpredictable, and more difficult path through life. Thus begins the hero’s journey. HERO BY NIGHT is a nostalgic nod to the old super hero comic, but is modernized with more contemporary art. Poor Jack. He’s such a dolt, especially in the eyes of his father, who desperately wants to make something of Jack. For once in his life, Jack has a place and a purpose and he uses it wisely. The only problem with HERO BY NIGHT is the occasional use of profanity. Nothing kids haven’t heard before but something that can be hard to justify in an elementary classroom. Middle school and high school English classes can get away with more language. The thing is, Coffman used replacement words too, so there is really no reason why the profanity was necessary. Leaving it out would have made it more accessible to elementary-aged school children. I recommend this for ages 10 and older because of the profanity. There are just a couple of incidents where there is a “dammit” and “hell,” otherwise the language is fine. There are plenty of substitution words such as “stinking” and “frigging” and the like. In his introduction, creator DJ Coffman writes about relating his love of comics and the hero mythology to his young sons. He gave them a stack of comics expecting them to dive right in, but what he got was more apathy than enjoyment. It wasn’t until they sat down and he helped them create their own story that their imaginations came alive. He certainly was onto something. Within that reflection, comes a fantastic idea for the classroom. Read chapter one to the students, which chronicles the story of Jack and his discovery of a super hero’s hideout. At the end of that chapter, pose the same question to your students that Coffman did to his children: “What would you do if you found a super hero’s headquarters, complete with all the super hero equipment? What if you discover that one of the artifacts, a ring, could give you super powers? Does that change your answer?” What a writing prompt! Students could develop strong, complex stories based on that one prompt. In the end, the students could compare and contrast their stories to HERO BY NIGHT. 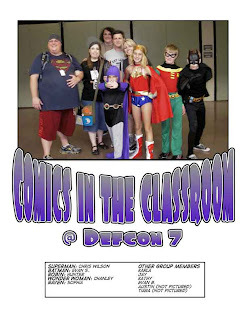 My experience with introducing comics to kids, however, is very different than Coffman’s. I have seen kids who hate to read beg for comics in my classroom. 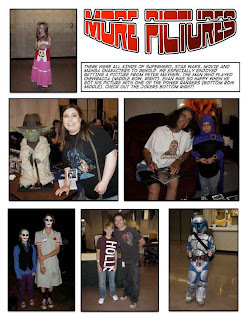 I do not just sit kids down with comics; I introduce the stories to the kids. I talk about the characters, plot, and elements they may find interesting, and reasons for them want to read. Then I let them pick. I offer more than superheroes and I offer many books at different reading levels. Wallpaper, cover art, and avatars are available from the publisher’s website. I loved the throwback to times-gone-by and the strong monomyth (hero’s journey). Vacations are the name of the game between semesters in college. As I take summer courses, those down times are short and precious. I took a bit of time off and the list grew like gangbusters. Note the democracy series of four books from Capstone Press. For those elementary school teachers out there, comics on our nation, constitution and democracy are out there. They have more titles than what I have here. Click on the links and consider your classroom or school library. Good radio programming doesn't just happen naturally. It takes planning, thinking and lots and lots of hard work. Jessica Abel, with help from Ira Glass, gives an inside look into one popular public radio show – This American Life – in RADIO: AN ILLUSTRATED GUIDE. As the comic version of Ira Glass notes on the first pages of this short book, "When correctly harnessed, radio can be as emotional, as funny, and as satisfying as the best motion pictures or television shows…. No mass medium is cheaper to do or easier to learn." 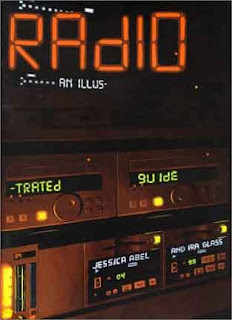 In the course of just 30 pages, Abel and Glass give the reader an intimate look at how the producers find, develop, and create radio programs that go to the heart of the human experience. From time to time, Abel (who is the main author and illustration here) injects herself as a character into the book as she interviews Glass about what he is doing, and why he is doing what he is doing. Abel is the reporter here, but she is successfully using the comic medium to tell the tale and capture the art of storytelling. It's interesting how one medium (graphic book) gives us insight into another medium (radio). Although this book could be read as simply a tutorial on how to get a piece published on the radio (or even, how to think about podcasting on the Web), RADIO: AN ILLUSTRATED GUIDE is much more than that. It is a story inside a story, letting the reader inside the world of creating stories, and the graphic platform seems to be a perfect way to capture this experience. Illustrations, narration, thought and speech bubbles – all of these techniques give the reader the sense of being in the room with Glass and his radio programmers as they hash out ideas and then bring them to fruition over the course of a few months time. RADIO: AN ILLUSTRATED GUIDE is a black and white production, and Jessica Abel's artwork is vivid in details. You can see the knobs on the engineering boards and the scripts in the hands of reporters. The backgrounds of most of the frames are helpful in establishing a true sense of the radio engineering studio, which can often seem claustrophobic as people lean in to over-sized microphones and tables strewn with coffee cups and food wrappers. These are scenes of people at work. Abel does a fine job, too, of capturing the personalities of the radio engineers and producers in her illustrations. The characters come alive within the frames and are very expressive. RADIO: AN ILLUSTRATED GUIDE is a rich resource for the classroom, particularly for teachers and students who are exploring the possibilities of radio and podcasting as a publishing venue for writing and voice. The book gives a detailed and insightful look at how a radio show on public radio is produced – with a true look at the difficulties of gathering sources, editing the pieces down to just a few minutes, and then finding space for all of the stories within a set block of time. The book also gives practical advice to beginners of radio on many levels including a page entitled “Make Radio At Home with Technology!” that demonstrates how to use a simple microphone and computer to create a podcast. For writing instruction, there is an entire page devoted to breaking down the way a radio script is created, with notes from Ira Glass on what works and what does not work when writing for radio. The book was first issued in 1999 as part of a fundraising effort for public radio and then released to the public in the following year. This book is appropriate for all ages with no violence or profanity. The reading level is more for middle and high school students, however. At times, Abel and Glass get a bit verbose in their writing. I went from one vacation (DefCon 7) to another one. I knew this ahead of time, but it didn't really dawn on me until it happened. I'm still on vacation; I'm remodeling the house this week. Posts to follow forthwith. Be patient.